1Not available with special financing, lease and some other offers. See dealer for details. 2Not available or combinable with all offers, must provide at time of sale, see dealer for details. Must finance with GMF or affiliates, not available with special finance. 3DON'T PAY TOO MUCH! Not available or combinable with all offers, must provide at time of sale, see dealer for details. Must finance with GMF or affiliates, not available with special finance. 4THIS IS A CHEVROLET CONQUEST INCENTIVE FOR CURRENT OWNERS/LESSEES OF A 1999 OR NEWER NON GM (I.E., NON-BUICK, CADILLAC, CHEVROLET, GMC, HUMMER, OLDSMOBILE, PONTIAC OR SATURN) PASSENGER CAR OR TRUCK WHO PURCHASE ONE OF THE ELIGIBLE NEW AND UNUSED MODELS LISTED IN GUIDELINE 5Not available with special financing, lease and some other offers. See dealer for details. 6ONLY CUSTOMERS WITH A CERTIFICATE QUALIFY FOR THE INCENTIVE. NO ADDITIONAL CUSTOMERS WILL BE ADDED TO ELIGIBILITY LIST. 7Excludes base models. Monthly payment is $16.67 for every $1,000 you finance. Example down payment: 19.9%. Must finance with GM Financial. Some customers may not qualify. Not available with lease and some other offers. Take new retail delivery by 4/30/2019. See dealer for details. 1Not available or combinable with all offers, must provide at time of sale, see dealer for details. Must finance with GMF or affiliates, not available with special finance. 2DON'T PAY TOO MUCH! Not available or combinable with all offers, must provide at time of sale, see dealer for details. Must finance with GMF or affiliates, not available with special finance. 3THIS IS A CHEVROLET CONQUEST INCENTIVE FOR CURRENT OWNERS/LESSEES OF A 1999 OR NEWER NON GM (I.E., NON-BUICK, CADILLAC, CHEVROLET, GMC, HUMMER, OLDSMOBILE, PONTIAC OR SATURN) PASSENGER CAR OR TRUCK WHO PURCHASE ONE OF THE ELIGIBLE NEW AND UNUSED MODELS LISTED IN GUIDELINE 4Not available with special finance or lease offers. Take delivery by 04-30-2019. 5ONLY CUSTOMERS WITH A CERTIFICATE QUALIFY FOR THE INCENTIVE. NO ADDITIONAL CUSTOMERS WILL BE ADDED TO ELIGIBILITY LIST. 6Excludes base models. Monthly payment is $16.67 for every $1,000 you finance. Example down payment: 19.9%. Must finance with GM Financial. Some customers may not qualify. Not available with lease and some other offers. Take new retail delivery by 4/30/2019. See dealer for details. 1ONLY CUSTOMERS WITH A CERTIFICATE QUALIFY FOR THE INCENTIVE. NO ADDITIONAL CUSTOMERS WILL BE ADDED TO ELIGIBILITY LIST. 2Excludes base models. Monthly payment is $16.67 for every $1,000 you finance. Example down payment: 19.9%. Must finance with GM Financial. Some customers may not qualify. Not available with lease and some other offers. Take new retail delivery by 4/30/2019. See dealer for details. When rugged was re-defined, the Chevrolet Colorado was born. This compact pickup truck aces its competition and is the front runner in the market for off-roaders and drivers alike. Improved performance and outstanding towing and payload capacities are just few of the reasons for its popularity. 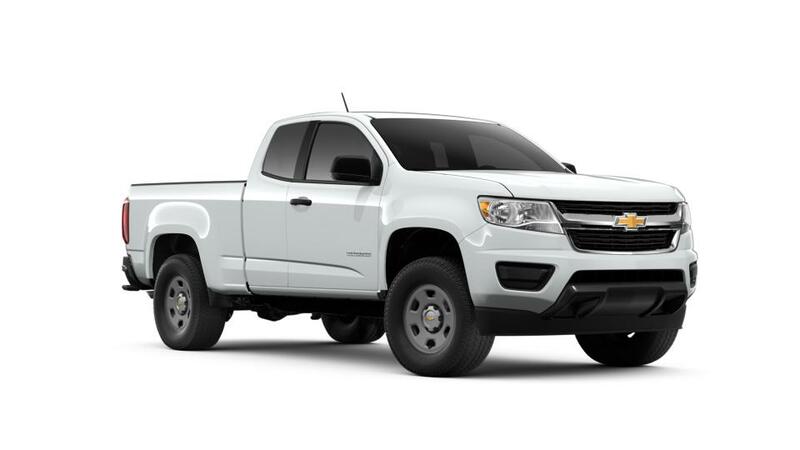 You can find a range of new Chevrolet Colorado models at our Houston showroom. The Chevrolet Colorado is extremely budget friendly. You can come down to Sterling McCall Chevrolet and explore the financing options available as well.